A recent research from Avendus Capital has some pretty exciting news for mobile apps and gaming userbase in India: It is exploding! SoLoMo or Social-Local-Mobile is a model which is driving digital businesses all over the globe and India is not an exception. Today’s information hungry smart phone user from India is keen on being social, interested in localization of his information needs, and wants everything on its mobile. India is certainly going through a very interesting phase of mobile usage growth. With more and more apps being introduced daily, Indians are using them for all types of purposes, right from finding love to being politically active. This is the time when 14 year olds are opening companies to create apps and doing good! In fact, the growth rate in India is so promising researchers estimate that by 2016, the market size of mobile apps and gaming would be around Rs 2700 crore! As per the research: “We have tried to estimate the potential for Indian paid apps market in 2016 using two methods—by estimating the potential revenues of the different application stores in 2016 based on how they have performed globally and in India to date, and by drawing parallels between the evolution of customer spend (ARPU) patterns on mobile telecom in India and the expected evolution of customer spends on digital content on mobile Internet in India”. 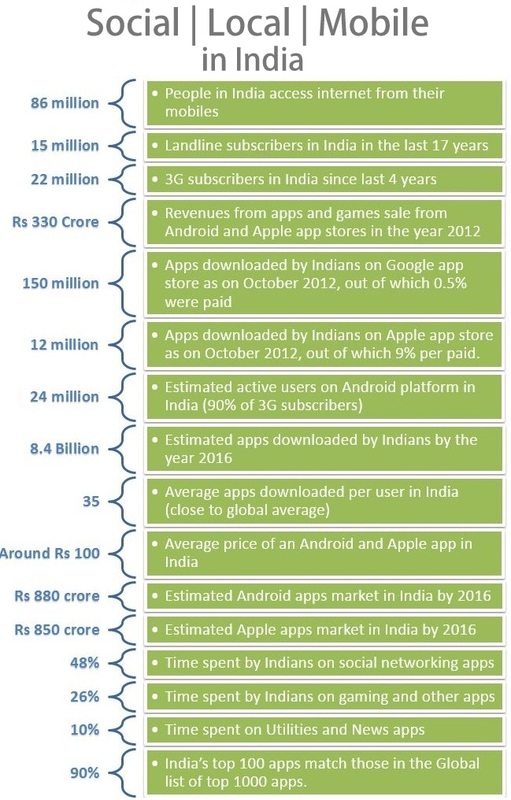 By this methodology, the estimated market for apps download in India comes to Rs 2700 crore by 2016. If you are a creator of mobile based apps and games, then what is your take in this never-seen-before growth saga? What are your plans to cash-in this explosion of mobile apps? If you are an avid user of apps and play games on your smart phone, then do you expect more exciting features in coming days? Please share your thoughts right here! Sales professionals don’t necessarily make good marketers!